The Berkeley Township School District in 2013 received national attention for its work in school security, being selected as a “National Exemplary Program” by the School Safety Advocacy Council. In the months following the honor, Dr. James D. Roselli, superintendent, and Dr. Jeffery Zito, the district’s director of elementary education, who also serves as district security coordinator, were encouraged by many to share their district’s approach. The following is their first-person account of how Berkeley Township, a Pre-K -6 district in Ocean County, used common sense and hands-on changes to increase security for students and the district overall. Dr. Roselli and Dr. Zito’s hope is that others in the educational community may be able to benefit from their experience. Berkeley Township Police Officer Scott Selby teaches a DARE lesson to a grade 5 class at Berkeley Township Elementary School. A township police officer is in each of the district’s four schools every day. Columbine, Colorado, High School Shooting: April 20, 1999 Twelve students and one teacher were killed along with the two shooters, who committed suicide. 9/11 Terrorist Attacks in New York City and Washington, D.C.: September 11, 2001 Al-Qaida suicide attacks using hijacked airplanes led to more than 3,000 casualties. Newtown, Connecticut, Sandy Hook Elementary School Shooting: December 14, 2012 A single armed shooter took the lives of 26 people, including 20 first-grade students. 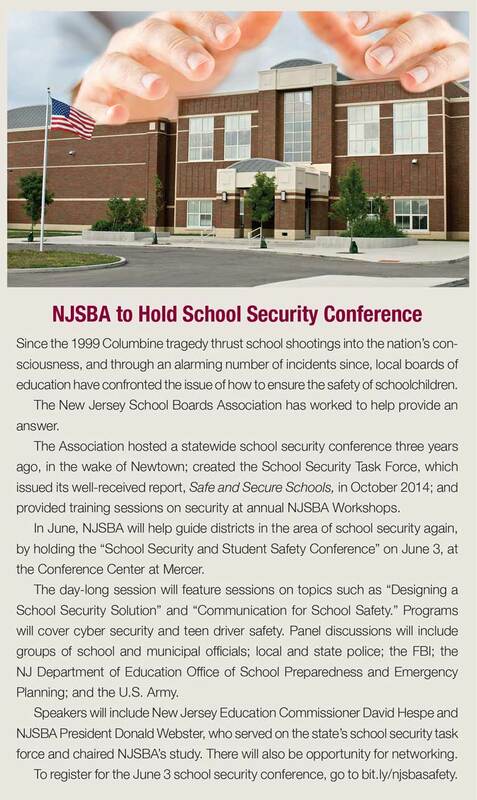 In the weeks following the tragic Newtown school shooting, our Berkeley Township district hosted several community forums to address and discuss school security and ways to improve it. Parents were provided with surveys in an effort to gain a clear understanding of areas of strengths and areas in need of improvement, with the goal of providing the safest and most secure environment for students and staff. Communication with Berkeley Township’s mayor, chief of police, parents, students, staff, board of education, and community was an important part of easing fears and positively impacting change. Police in Schools The first major change we made was to implement a program of placing police in our schools. Currently, there is an armed Berkeley Township police officer in each of our four schools on a daily basis. The local PBA, along with the mayor and town council, reached an agreement in which the police reduced their overtime rate of pay from $70 to $30 per hour, for officers to be placed in the schools during school hours. The cost to the district is approximately $170,000 per year. This may appear a significant dollar amount, but we surveyed more than 2,000 parents, and more than 95 percent indicated they would feel most comfortable with uniformed police officers at each school, a security measure which was supported wholeheartedly by the board of education. The officers also have a computer at each school location, giving them the ability to view all cameras at that school, both inside and out. Officers assist at arrival and dismissal of the children on a daily basis and have really been a positive addition to our school community. 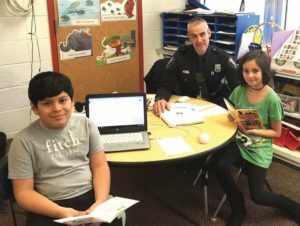 Police interact with students in Berkeley Township’s schools. Posting police in the schools is a key part of the district’s program. Independent School Security Audit An independent school security audit company was hired to obtain an unbiased opinion of our security procedures and to obtain their recommendations for improvements we could make. The company performed random checks at each of our schools to see the reactions of students and staff. They were pleased with how vigilant our staff members were in questioning a stranger’s attempted entrance into the school without a visitor’s pass. As part of the needs assessment of this report, we realized the importance of communication between administrators, and the fact that multiple levels of communication are often needed during an emergency situation. Administrators were provided cellular phones and given training on how to use them in a situation requiring an emergency response. The audit, conducted by Seraph School Security Audit, cost our district $17,500. Cameras All four of our schools are equipped with internal and external cameras that are monitored by our officers in the schools. Our camera system allows us to look back 30 calendar days, which enables police and school employees to review video if vandalism occurs over the weekend or a school break. Also, all of our buses are equipped with cameras to assist with reducing inappropriate student behavior and monitor all travel of our drivers and bus fleet. The installation of cameras began a few years ago, and over time we have continually added to and improved upon our camera systems as technology continues to make advancements. We estimate the district has invested $100,000-$150,000 in cameras and related software since 2006. Our police officers contribute their expertise in strategically placing cameras in and around our campuses. Replacing Keypads on External Doors with ID Swipe All exterior doors to the schools were numbered and photographed. These photographs were shared with the Office of Emergency Management. All exterior doors are tested on a routine basis to ensure they remain locked at all times. All staff and students were informed they are never to open a door for anyone, even if they knew that person. All visitors to the buildings must report to the main office of the schools for admittance, without exception. In addition, all keypads were removed from exterior doors and replaced with ID swipe pads. Like the installation of cameras, changing the door locks is something that began prior to 2013, and we estimate about $20,000 has been spent thus far on changing the locks. Only authorized school and district employees can gain entrance into the building by using their district-issued ID cards. Through the use of these ID cards, we are also able to determine which staff members are in the building on any given day and at what time they entered and left the building. Updating Entrances/Creating “Man Traps” All school entrances were updated throughout the district by creating a “man trap” area, an area where visitors must stop before gaining entrance into the building. This vestibule area in each school is locked to prevent entry into the building. All visitors are now asked a series of questions prior to entering the building. All visitors must wear a visible identification tag during their stay in the building. Review/Update/Revise All Security Drills and Plans Throughout our work to enhance security, we saved money by doing work in-house. Technology staff employed by the district installed our security cameras and upgrades to the camera system. In addition, many of the security enhancement steps we took did not require a cost. For example, using a checklist provided by the State of New Jersey, a safety and security plan was created for each of our schools. This plan is updated on a yearly basis. Security drill procedures have also been changed. We now conduct drills in inclement weather, with blocked exits and diversions created. We conduct drills during lunch and recess times. Officials from the fire department are present during drills as are our police officers who are stationed in the schools. Create District School Security Team/Review of Drills with Students and Staff School security teams were created comprised of administrators, staff, and community members. Meetings were scheduled three times yearly to review security and drill procedures. With each drill practiced, suggestions were made for improvements. Staff members were notified of any drill procedure changes. Our board of education created a school safety committee that provides reports at our monthly board meetings. Grounds Maintenance Our school grounds are maintained to eliminate hiding areas. All shrubs and bushes on school properties are trimmed to increase visibility. Lawns on school properties are cut on a routine basis. Stay Current and Open to New Ideas; “ALICE Training” We realize our security procedures and practices can always be improved upon. One new method of training we have learned about is ALICE (Alert, Lockdown, Inform, Counter, Evacuate). This method suggests staff and students may need to use more than one lockdown option of running, hiding, or fighting, and that they should use their best judgment to determine their response to an active shooter. They may need to fight back, use barricades or counter. These proactive strategies are designed to increase the chance of survival during an armed intruder event. This is a federal training program that is moving down to schools, that is not mandated by the state. We have looked at it, and if it is something we think is good, we’ll implement it. The positive input we have received from parents, staff, students, police officers, fire department members, our board of education and town council has helped us to update and revise our security practices to protect our most valuable asset, the children of our district. The tragic shootings of the past few years have taught us that school districts can no longer assume their schools are a safe haven within their communities, and that districts should have a detailed plan to protect their staff and students on a daily basis. Dr. James D. Roselli is Berkeley Township school superintendent. Dr. Jeffery Zito is director of elementary education.